The vertebrate nervous system is deeply divided into ‘somatic’ and ‘visceral’ subsystems that respond to external and internal stimuli, respectively. 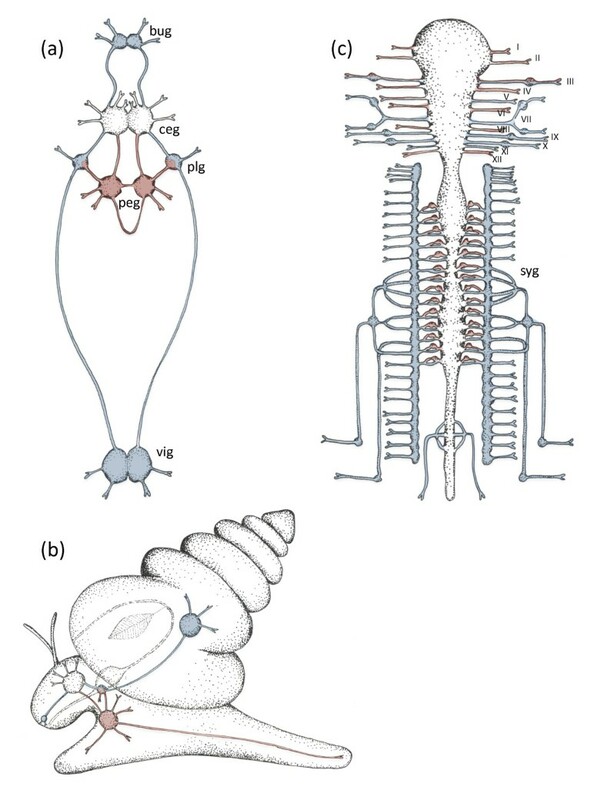 Molecular characterization of neurons in different groups of mollusks by Nomaksteinsky and colleagues, published in this issue of BMC Biology, reveals that the viscero-somatic duality is evolutionarily ancient, predating Bilateria. Starting with the work of the French physiologist Claude Bernard in the 19th century, vertebrates have been considered ‘dual entities’, composed of a ‘somatic’ and a ‘visceral’ animal responding to different environments: a milieu extérieur in which the organism is situated, and a milieu intérieur in which the tissue elements live . Accordingly, somatic versus visceral nervous systems would mediate sensory-motor responses to the external and internal environment, respectively. In recent years, the comparison of molecular fingerprints has been used for tracing the evolution of animal cell types. For example, it has been proposed that somato-motor neurons in vertebrates, insects, nematodes and annelids and branchio-motor neurons in ascidians and vertebrates are homologous cell types . Nomaksteinsky et al. have now used molecular fingerprinting to tackle a long-standing question in comparative neuroanatomy and neurophysiology, which is the evolutionary origin of the somatic versus visceral nervous system duality. The vertebrate somatic nervous system involves somato-sensory neurons, located mostly in the dorsal root ganglia, ear and nose, perceiving environmental stimuli (primarily mechanical and olfactory, but also electromagnetic and thermal) and somato-motor neurons governing the locomotor response. The visceral nervous system, in turn, is composed of sensors for internal conditions and effectors controlling body homeostasis . These viscero-sensory neurons are located in the blood vessels, airways or digestive tract monitoring the internal partial pressures of oxygen (pO2) and carbon dioxide (pCO2), blood pH, organ stretch and, last but not least, taste, and produce cardiovascular, respiratory and digestive responses. The vertebrate somatic-visceral ‘duality’ is reflected by the differential usage of specific homeodomain transcription factors that drive cell-type specification. Subsets of somato-sensory neurons are specified by the POU domain factors brn3a/b/c, contributing to their development, axonal projection and survival . In somato-motor neurons the EGH homeodomain transcription factor hb9/mnx is active, controlling specification, migration and axonal projection . Finally, in almost all sensory and motor neurons of the vertebrate viscero-reflex-circuits the paired-like homeodomain transcription factor phox2b is present, likewise controlling specification, differentiation and axonal connectivity . Previous studies indicated that the brn3-hb9-phox2-based differential specification of the somatic and visceral neurons is conserved outside vertebrates, at least to some degree. In Caenorhabditis and Drosophila, the brn3 orthologs unc86 and acj6 are essential for specification and axonal targeting of the primary touch and olfactory somatic-sensory neurons, respectively [8, 9]. Drosophila hb9 specifies subsets of somato-motor neurons and interneurons and is required for the development of their projections. phox2, on the other hand, has been found in the motor neurons of the cerebral ganglion of the post-metamorphic ascidian Ciona, an invertebrate chordate, considered viscero-motor as they innervate the muscles of the branchial basket. To elucidate the evolutionary origin of the viscero-somatic duality, Nomaksteinsky and co-workers have investigated several species of mollusks, which, together with annelids and other invertebrates, belong to the superphylum of Lophotrochozoa. Mollusks are an excellent choice, given that a huge body of electrophysiological, behavioral and anatomical studies revealed a rich diversity of visceral and somatic functions. The mollusk nervous system comprises ventral somatic (pedal) and lateral visceral chains of ganglia, connected by commissures and longitudinal connectives (Figure 1). While the pedal cord innervates the body and foot and mediates locomotion and escape behaviors, the visceral cord innervates the pharyngeal walls, salivary glands, mantle, kidneys, gonads, gills, liver, heart and gut, among others . Nomaksteinsky et al. now show that brn3 is expressed in clusters of mechano- and nociceptive sensory neurons (as identified by coexpression of the neuropeptide Sensorin A in the opisthobranch gastropod Aplysia californica (the California sea slug) and in the pulmonate snail Lymnaea stagnalis. In Lymnaea, brn3 is co-expressed with drgx and islet, both of which are expressed in somato-sensory neurons in vertebrates, and with the vesicular glutamate transporter vglut, indicative of glutamatergic neurons as present in the murine dorsal root ganglia. The brn3+/drgx+/islet+/vglut + molecular fingerprint of vertebrate somato-sensory neurons thus appears to be conserved in mollusks. Likewise, the molecular fingerprint of vertebrate somatic-motor neurons (hb9/mnx+/lhx3/4+/acetylcholine+)  was detected in the pedal ganglia of Lymnaea, indicating evolutionary conservation. hb9 was also found active in the pedal lobe of the subesophageal ganglionic mass of the cephalopod Sepia officinalis, in agreement with its locomotor function. Finally, Nomaksteinsky et al. detected expression of the visceral marker phox2 in specific sets of previously described visceral neurons  in all groups, including the cephalopod-specific stellate ganglion, which contains postsynaptic motor neurons controlling the siphon, in line with the ancient ‘visceral’ nature of this structure (for respiration rather than propulsion). The somatic (red) and visceral (blue) nervous systems in mollusks and vertebrates. (a) In mollusks, the pedal cord interconnects the preoral cerebral ganglia (ceg) with the postoral pedal ganglia (peg). The visceral cord interconnects visceral ganglia (vig), pleural (plg) and buccal ganglia (bug), forming a second ring around the gut. (b) The same ganglia shown in an adult snail from a lateral view. (c) In vertebrates, roman numerals (I to XII) label the cranial nerves. syg, sympathetic ganglia. Taken together, this is strong evidence that the somatic-visceral duality predates the bilaterian divergence. However, key questions remain. First, homology of somato-sensory and -motor neurons between mollusks and other bilaterians appears plausible given their conserved molecular fingerprints. Yet, the evidence is incomplete. In annelids and vertebrates, this homology is further supported by developmental data, showing that the respective neuron types arise from corresponding neurogenic columns ; in mollusks, the developmental origin of the respective neurons is unknown. Regarding the significance of phox2 expression in the visceral nervous system, any interpretation of the data in terms of a simple one-to-one cell type homology is difficult. Obviously, the set of vertebrate phox2+ neurons is quite diverse, encompassing many different types of viscero-sensory as well as viscero-motor neurons, with divergent embryological origins, functions, innervation and target sites. Which of these would correspond to any of the mollusk neurons, which, among others, innervate mollusk-specific organs such as the mantle or the osphradia, special kinds of respiratory organ? Nomaksteinsky and colleagues refer to the concept of ‘deep homology’ (which implies the re-use of a conserved master regulator in evolution, leading to a similar cell fate)  to explain the common usage of phox2 (and also brn3) in vertebrate versus mollusk visceral neurons. The shared expression of phox2 would then merely reflect the conservation of a particular phenotypic trait that visceral neurons have in common and that is downstream of phox2, for example ‘to direct axonal projections towards somatic versus visceral targets’, as the authors propose. In their favor previous studies showed that the over-expression of phox2 in non-visceral cells suffices to induce a visceral-motor axon phenotype ; and in phox2 knockout mice visceral-sensory neurons change their axonal projections to those of somatic-sensory neurons . Also, the authors argue that both the viscero-motor autonomic ganglia in vertebrates and the stellate ganglion in cephalopods are considered new characters (synapomorphies) and thus should not find a counterpart outside the respective groups; yet, they both express phox2. Once they evolved, the partaking neurons of these ganglia might have started to express phox2 anew, thus becoming visceral and connecting to the pre-existing visceral circuits. However, this interpretation is problematic, too. It is hard to see what the highly diverse population of phox2+ neurons in vertebrates and mollusks has in common as a purely ‘visceral’ feature that could guide their proper interconnection not only as presynaptic neurons (that could be partially explained by the downstream expression of axonal guidance molecules, such as neural cell adhesion molecules) but also as postsynaptic neurons, targeted by pre-existing visceral neurons. Also, one would have to assume that ‘de novo’ evolving visceral neurons would start projecting to their new visceral targets from one generation to the next, once phox2 is activated (by a cis-regulatory change), leaving little room for gradual evolution. An alternative explanation might be the recently proposed ‘division of labor’ scenario . This scenario assumes that neurons that partake in a given circuit have arisen by segregation of cellular functions to different sister cell types, which diverge but remain interconnected by axons. This concept allows for neuron types to be gradually relocated to remote locations during evolution. To stay with the example mentioned by the authors, the phox2+ first order (presynaptic) motor neurons of the palliovisceral ganglion and second order (postsynaptic) visceral-motor neurons of the stellate ganglion might have arisen from a single visceral neuron by cell type duplication. Then, the resulting post-ganglionic type would have been relocated to the periphery while the resulting pre-ganglionic neuron might have remained in the palliovisceral ganglion. This concept implies that there is not a simple one-to-one but rather a many-to-many homology-relationship between phox2 neuron types of the circuits compared. The work of Nomaksteinsky et al. raises additional interesting questions regarding the evolution of the somatic-visceral dualism. If both systems were in place in stem bilaterians, did they evolve independently or by duplication from a single, simple sensory-motor precursor circuit? And what were the most ancient sensory modalities and motor outputs of these two circuits, once they evolved? The most fascinating perspective comes from the fact that the urbilaterian ancestor was a marine animal as this has profound implications for what is regarded as external (somatic) and internal (visceral). In the marine world, the canonical viscero-sensory stimuli were clearly external: osmolarity, pH, pO2 and pCO2 reflect the quality of the surrounding water and thus inform the organism about the environment, the milieu extérieur (see above). Moreover, the chemical sense of taste, considered visceral by function and molecular identity, can also be regarded as ‘external’, as it informs about food. This would imply that both the ancient urbilaterian ‘visceral’ and ‘somatic’ circuits were in fact conveying information from the exterior. It appears that this environmental information has simply been ‘sorted’ into divergent circuits with regard to its (differential) downstream effect. For example, the somatic circuit processed all information relevant for locomotion (that is, mechanical stimuli and olfaction); part of the visceral circuit instead processed chemical information relevant for feeding and accordingly controlled the movement of the gut. Other parts of the ‘visceral’ circuit, however, might have integrated information regarding water quality, gas levels and pH into a - yet unknown - ancient effector system. Future work in simple marine invertebrates should elucidate these fascinating questions further.